Greenpeace has done that part of the world whose representatives are so corrupt or so stupid as to sign on to the Trans-Pacific and Trans-Atlantic "partnerships" a great service. 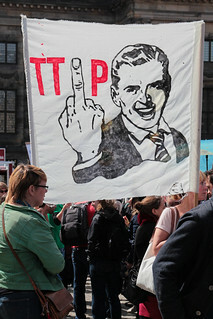 Greenpeace secured and leaked the secret TTIP documents that Washington and global corporations are pushing on Europe. The official documents prove that my description of these "partnerships" when they first appeared in the news is totally correct. These so-called "free trade agreements" are not trade agreements. The purpose of the "partnerships," which were drafted by global corporations, is to make corporations immune to the laws of sovereign countries in which they do business. Any country's sovereign law whether social, environmental, food safety, labor protections -- any law or regulation -- that impacts a corporation's profits is labeled a "restraint on trade." The "partnerships" permit corporations to file a suit that overturns the law or regulation and also awards the corporation damages paid by the taxpayers of the country that tried to protect its environment or the safety of its food and workers. The lawsuit is not heard in the courts of the country or in any court. It is heard in a corporate tribunal in which corporations serve as judge, jury, and prosecutor. In other words, the "partnerships" give global corporations the power to overturn democratic outcomes. Allegedly, Europe consists of democracies. Democracies pass laws protecting the environment and the safety of food and labor, but these laws democratically enacted reduce profits. Anything less than a sweatshop, with starvation wages, no environmental protection, no safety legislation for food or worker, can be overturned at will by global corporations under the terms of the "partnerships." The Trans-Atlantic and Trans-Pacific "partnerships" have been conducted in secrecy. The reason is obvious. Had people known how they were being sold out, there would have been a firestorm of protest. The corporate shills and their propagandists in the financial media could deny my revelations, because I had no official documents to release. The "partnership" agreements are treaties. Under the US Constitution, treaties are the prerogative of Congress, not the prerogative of an executive branch-appointed Trade Representative who represents not the people but the corporations seeking the advantage. To avoid the US Constitution, the agreements are defined as non-treaties. You see how the groundwork for corruption is established. The way it works is that the appointed US Trade Representative "negotiates" with appointed trade representatives of other countries. Any resistance to the deal is overcome with bribes and intimidation. All of the negotiation is conducted in secrecy. When the trade representatives sign on to the deal, it is presented to the legislatures of the countries. The legislators are told that they must approve the pact and not endanger all the hard work that has gone on for so long and that is in everybody's interest as attested to by all of the bribed and coerced trade representatives. These "trade pacts" originate in the US, because American global corporations and the American mega-banks are the largest players in the world economy, and the agreements that the corporations walk through the process give the American companies economic hegemony over the countries that sign the agreements. The Trans-Atlantic and Trans-Pacific "partnerships" are tools of US financial imperialism. Today (May 3, 2016) I debated on Press TV Sean O'Grady, the financial editor of the UK newspaper the Independent. It is extraordinary that O'Grady took a line totally opposite to that of his newspaper. I suggested to him that perhaps he should read his own newspaper. Today an article in the Independent reported that the leaked "documents show that US corporations will be granted unprecedented powers over any new public health or safety regulations to be introduced in future. If any European government does dare to bring in laws to raise social or environmental standards, TTIP will grant US investors the right to sue for loss of profits in their own corporate court system that is unavailable to domestic firms, governments or anyone else. For all those who said that we were scaremongering and that the EU would never allow this to happen, we were right and you were wrong." As I understand it, the situation is worse than the article describes. TTIP applies to laws already on the books, such as France's laws against GMO seeds and food products. "Today's shock leak of the text of the Transatlantic Trade and Investment Partnership (TTIP) marks the beginning of the end for the hated EU-US trade deal, and a key moment in the Brexit debate. The unelected negotiators have kept the talks going until now by means of a fanatical level of secrecy, with threats of criminal prosecution for anyone divulging the treaty's contents. "Now, for the first time, the people of Europe can see for themselves what the European Commission has been doing under cover of darkness -- and it is not pretty. The leaked TTIP documents, published by Greenpeace this morning, run to 248 pages and cover 13 of the 17 chapters where the final agreement has begun to take shape. The texts include highly controversial subjects such as EU food safety standards, already known to be at risk from TTIP, as well as details of specific threats such as the US plan to end Europe's ban on genetically modified foods.